The original print was made in 1970 by Stephanie. The following article By Katherine Petrin discusses The Old Spaghetti Factory This is the first in a series of articles on North Beach’s landmark buildings. Imported olive oil and cheese warehouse, seltzer water bottling plant, cabaret, art gallery and restauant — how many lives may a building have? Consider this question as you pass by San Francisco Landmark No. 127 at 478 Green Street. Within North Beach there are a number of designated landmark buildings and sites. Some of these are quite well-known and easily recognizable, such as Coit Tower, St. Francis of Assisi Church and Washington Square. Because buildings, objects and sites can be landmarked for historic significance or other reasons, not only for impressive architecture, the landmark status of an unassuming building might come as a surprise to some readers. One such building is the Old Spaghetti Factory, a former industrial structure at 478 Green St., between Grant and Kearny, San Francisco Landmark No. 127. 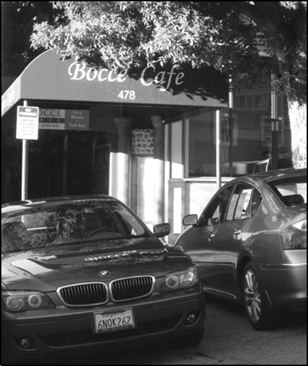 The building is currently occupied by Bocce Café and Maykadeh restaurant. The construction date of this building can be traced to the immediate post-earthquake and fire era. Its first owners, the Granucci Bros., were importers of olive oil and cheese. In 1911, it operated as a seltzer water bot- tling plant. Later, Baccigalupi, Casaretto & Demartini, proprietors of the Italian-American Pasta Co., operated a pasta factory there from 1912 until 1955. Built by contractors Saraille and Lagomarsino, this three-story building was built as a factory and warehouse. It was not architect designed. The utilitarian, wood-frame structure measures 48 feet in height, has horizontal wood siding, and 4-over-4 double-hung windows. As an industrial building, it was built for function without ornamental detail typical of the era or even a cornice. Unlike all other buildings on the block and most in the neighborhood, the Old Spaghetti Factory building is detached, set apart from neighboring buildings with open passages on the east and west sides. Manufacturing facilities were often built as stand- alone structures to facilitate access and the delivery and shipping of materials and goods. Of greater importance, within a predominantly residential neighborhood, the increased risk of fire in industrial settings and the fear of it spreading to adjacent structures meant that industrial buildings were often detached. In the 1950s, a major fire occurred in the pasta factory. It was renovated and sitting vacant when entrepreneur Frederick Walter Kuh saw it in 1956. Freddie, a Chicago native and former resident of Paris, was then a waiter and bartender at the Purple Onion. He jumped at the chance to take over the raw space for a rent of $300 a month. Within the former industrial facility, Freddie opened the Old Spaghetti Factory and Excelsior Coffee House, launching a new and colorful chapter in the building’s history. Freddie referred to himself as a “Bohemian businessman.” His operation — cafe, restaurant, theater- cabaret and art gallery — was a “smash” from the day it opened, according to newspaper accounts. 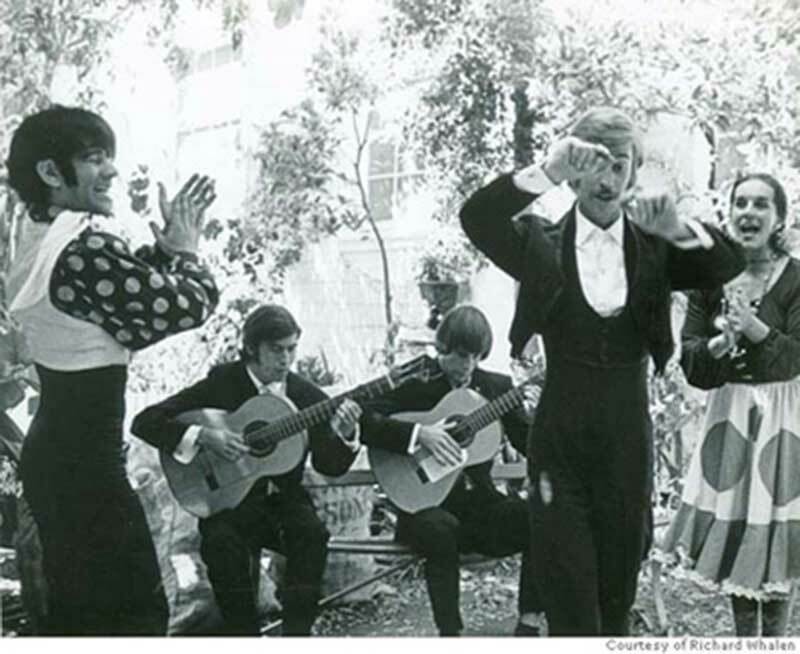 Also inside was the “Kuh Aud.,” an auditorium or open space for cabaret and musical performances, and the adjoining Flamenco Theater, a replica of an Andalusian café that operated for more than 20 years as a showcase for Flamenco dance, song and guitar. A 1979 article in the San Francisco Sunday Examiner & Chronicle quoted former employee Becky Jenkins as saying that Freddie was sharp at spotting talent and good people. He made the Factory into a haven for homosexuals in the days before there was a gay rights movement. Freddie thrived in the outrageous environment that was the Old Spaghetti Factory, creating a place that was more of an “orphanage commune” than a restaurant. Some of Freddie’s loyal staff were archly referred to as “otherwise unemployable.” The Factory was a true original, appreciated for its eclectic décor, Bohemian clientele, affordable pasta fare, live entertainment, funky vibe and high-spirited staff. The place was furnished with items from Fred’s personal collection of Victoriana, random kitsch, architectural castoffs and paintings and sculpture done by friends. Musicians who played at the Old Spaghetti Factory Former site of Old Spaghetti Factory today. photo: Julie JAycox included Arlo Guthrie, the Congress of Wonders, Dino Valente, Ramblin’ Jack Elliot and Dan Hicks and His Hot Licks. The Factory survived until 1984, the year Freddie sold the business. The memorabilia and furnishings of the Old Spaghetti Factory were offered through an onsite auction by Butterfield’s the same year. 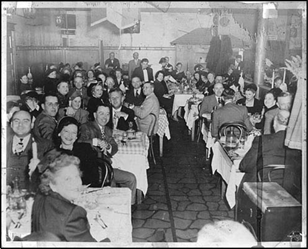 From 1956 through 1984, the Old Spaghetti Factory was North Beach’s hub of artistic activity, opera, flamenco and cabaret, attracting artists and writers, neighbor- hood folks, Bohemians and Beats. (And, yes, a film has been made. 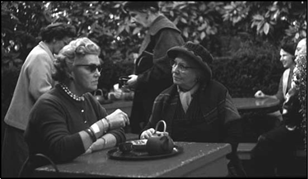 Look for the next screening of “ The Old Spaghetti Factory” (2009) by filmmakers William Farley, Mal Sharpe and Sandra Sharpe.) It was designated San Francisco Landmark No. 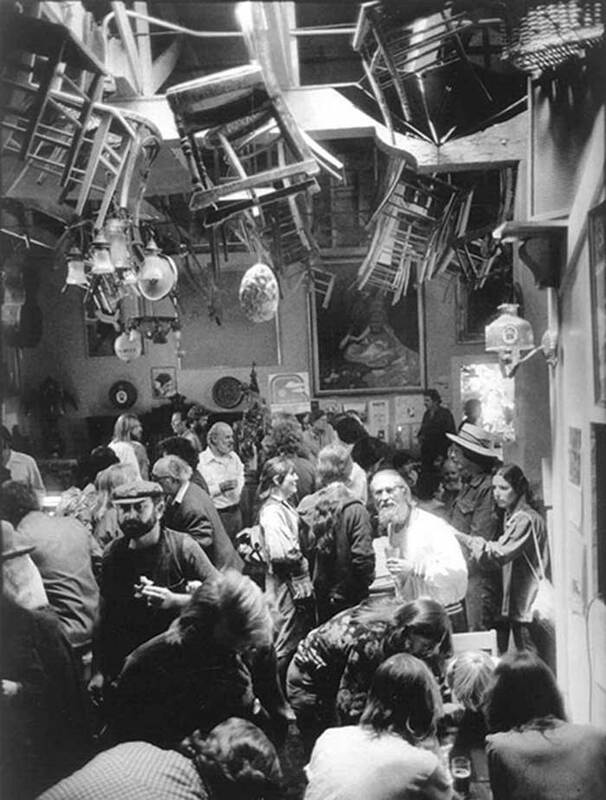 127 in 1981 on the basis of its significance as a cultural and social center in North Beach. The landmark case report further stated that “the Beatnik era was born in the district and its leaders very quickly associated themselves with the Spaghetti Factory; Ferlinghetti and Ginsberg in poetry and Kerouac in prose.” Other notable individuals from the arts who have been associated with the Old Spaghetti Factory are photographer Jerry Burchard, the Kingston Trio, flamenco dancer Cruz Luna, Richard Brautigan and Robin Williams, to name a few. Former site of Old Spaghetti Factory today. I just discovered you and realized your current exhibit will be available in GA until October. I’m going to do my best to come there to meet you and see your art! What a wonderful surprise. I just saw your comment. I’ve been busy getting ready for the show. I’m going to send you an email. Great to hear from you and I hope you can make it. I am a big admirer of your talent. I have purchased “The Spaghetti Factory Garden” around 12 years ago from private party, and it’s on a prominent place in my home since. I love it! Always make me stop, look closely, find some new details every day. Size is 17.5″ by 25″ (etching itself). I bought it framed with a matting. Is it possible that I own the original? I would appreaciate you getting back to me. This piece of artwork is a limited edition, etching and engraving hand-printed by the artist, Stephanie Scott, in her studio in Walnut Creek, California. To make an etching, Stephanie cuts a metal plate (zinc or copper), polishes it with steel wool, heats it and applies a “hard ground” by melting several spots of a ball of hard ground onto the hot etching plate and rolling out a smooth, even coating which will look dark chocolate brown and will not be sticky when it has cooled. Hard ground consists mainly of beeswax which is soft and pliable but clear and roofing asphaltum which is dark brown yet brittle. The two combined make a dark coating which will allow detailed linear work to be drawn without chipping off and which will allow the artist to see what she is doing when she begins drawing with the etching needle since the lines and dots she draws will appear as shiny metal surrounded by the dark chocolate brown etching ground. Since the ground will not be tacky or sticky when cooled, it is called a hard ground and Stephanie can rest her hand on the plate as she draws. Before she starts the drawing on the grounded plate, she traces the perimeter of the plate onto sketch paper and uses a viewfinder to plan her composition which she first sketches onto the paper in line only and later adds the value structure (shaded areas). This to-scale drawing on paper in ink or pencil is freely and quickly done and is a guide drawing. Stephanie then takes a soft black “litho pencil” (a water soluble grease pencil) and draws the main shape divisions on top of the dark brown etching ground using the litho pencil. This shows Stephanie her main shape areas as indicated by her earlier drawing. Stephanie then takes an etching needle (a sharp pointed metal stylus) and begins slowly drawing in the detailed lines and patterns of lines and dots by drawing with the etching needle through the waxy etching ground. The etching needle glides through the waxy ground easier than a pencil moves on paper. If Stephanie wishes to make corrections at this stage, she paints out the area to be changed with pure liquid roofing asphaltum and lets it set up, but not dry completely and then makes the corrected drawing through this coating. Corrections after the plate has etched would have to be removed from the metal using a series of tools. When the drawing is completed, any area of the plate which should not be etched (the sides of the plate, scratches on the back or front) are all painted out with the asphaltum. The plate is then immersed in an acid solution (nitric for zinc and hydrochloric for copper). The acid begins dissolving the metal where the lines and dots Stephanie has drawn are exposed. Zinc plates have to be brushed with a bird feather during this process, as bubbles form on the lines and need to be brushed off so the lines etch evenly. Areas with more lines will etch faster than more sparsely drawn areas. When an area has “cooked enough” (Stephanie can read the plate and tell when this has occurred and she also tests the lines with an etching needle to see how deep they are) the plate must be removed from the acid, the acid washed off, water dried off and the areas which have etched deeply enough must then be protected by painting them out with liquid asphaltum. The asphaltum is allowed to dry slightly and the plate is reimmursed in the acid so that the slower etching areas can catch up. On a small or medium sized plate this is done about 4 to 6 times. On a large plate, it takes many more times in and out of the acid. Thus, as the plate is etched, the original drawing in the wax is destroyed and becomes a tarry mess. When the plate has etched enough, Stephanie uses paint thinner, rags and an old tooth brush to remove the etching ground and asphaltum. The drawing has now been etched into the plate and the lines are beneath the surface of the plate, ready to hold ink. Next she bevels the edges of the etching plate to a 45 degree angle using an electric grinder and hand tools and polishes the edges so they will not cut her paper and the etching press blankets. Stephanie then immerses her 100% rag etching paper, which she has previously torn to size, into a tray of water and begins inking the plate by warming the plate, and scraping etching ink over the lines with small pieces of matboard, pushing the ink down into the lines. Etching ink is thicker than honey. The next layer of ink is removed by wiping the plate with a puffy wad of tarlatan cloth (looks like stiff, starchy cheesecloth) in a circular motion out onto newspaper which absorbs some of the excess ink. The final stage of inking a plate is called a “hand wipe” and Stephanie uses the backs of her hands and her fingers to remove the final layer of ink off the shiny areas of the plate. A stiff, brusque motion is used so the ink comes off the shiny (white) areas but piles up on the lines. The edges of the plate must be cleaned with small rags. Next it is time to set the pressure on the press, fold the 3 etching blankets back, place the plate on the press bed and dry the paper. The paper is lifted from the water vat and the surface water dried from it using towels. The paper is very soft and pliable but the surface water has been removed. The paper is placed over the plate, the three blankets positioned and the plate is wound through the press which applies about 500 lbs. per square inch of pressure to the plate and paper. Next Stephanie peels the paper off the plate to see what she has. In drawing the plate, what was on the left is now on the right, what was light is now dark and vice versa so the artist doesn’t really know what the etching will look like until it is printed. Stephanie prints or “proofs” the plate twice at this stage. One shows what she really has and the other proof is one she will draw on to plan out finish work. If there is extensive work, another etching ground will have to be applied and the whole etching process repeated. If there is less work (and Stephanie tries to attain a degree of refinement before etching the plate so this is sometimes the case) finish work can be done without acid by engraving the plate by cutting the metal by hand with a burin. 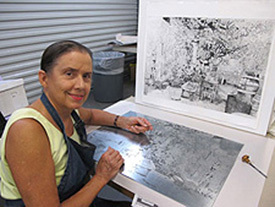 All of Stephanie’s etchings include finish work with engraving. Each time the plate is printed to see the additions, it is called a proof and the proofs become more and more finished until Stephanie calls it finished. At that time an edition number is determined and an edition of prints is printed. An edition of prints can have up to 10% of the edition as finished artist’s proofs (A.P.) and the edition number is noted by a fraction with the top number being which print the piece is in the series and the bottom number the number or prints in that edition. (Example 25/125). Since the artist is not creating just one image but is creating an edition of prints, the extra time, tools, equipment and supplies are used to make the entire edition. Therefore single pieces with such exquisite detail and beauty can be affordable. Stephanie draws her flowers from real live flowers, many of which she grows in her painting garden in Walnut Creek. She draws her landscapes on location at places she has lived in or traveled to. 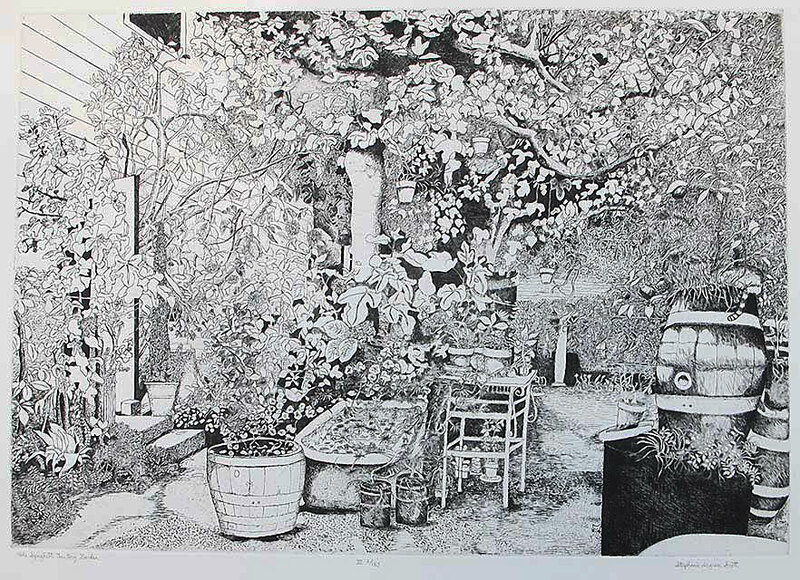 With her flowers etchings, Stephanie often prints a black and white edition and a “second state” edition which is printed in green ink and watercolored. Stephanie puts a lot of energy into her work and loves what she does. She greatly appreciates anyone who purchases her work and hopes that you or whomever you give it to will enjoy it for many years. When I initially commented I clicked the “Notify me when new comments are added” checkbox and now each time a comment is added I get three emails with the same comment. Is there any way you’ll be able to remove me from that service? Cheers! Sorry about that. I have been having a spam problem. I believe it is fixed.